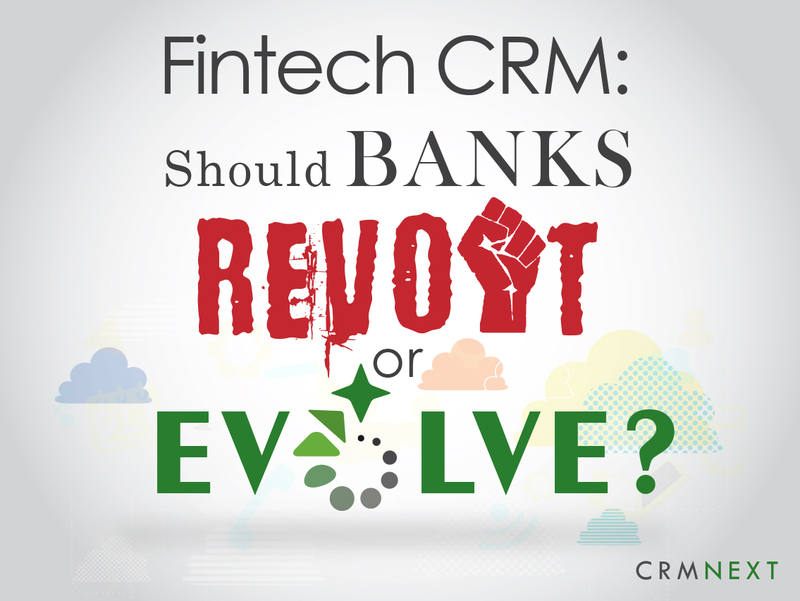 The Best CRM Blog: Fintech CRM: Should Banks Revolt or Evolve? Fintech CRM: Should Banks Revolt or Evolve? Arishima Meiji from Tokyo, Japan, runs a mid-size coffee parlor. Recently, a coffee vending machine broke down, hampering day to day business operations. He quickly needed a replacement that was quite expensive. He approached a few large banks, who demanded endless stacks of documents with no guarantee of approval. Frustrated, he applied to a new digital payments firm. The firm took digital copies of his documents, verified his credibility (integrated with credit agency), approved his loan in 3 minutes and disbursed the amount to his account. Compare this with 3 or more 'days' of traditional large banks. Learn how Bajaj Auto introduced 'instant' in their loan processing vocabulary. These are turbulent times for banks across the globe. The story is the same everywhere. Share prices are tumbling and Non Performing Assets (NPAs) are burgeoning. The recession has badly hit both banking behemoths and smaller ones. Add growing ambitions of nimbler digital payment outfits (Klarna, a Swedish e-commerce firm boasted USD 10 billion payment transactions and is making plans to become a lean banking machine) and the future (at least the near one) doesn't look rosy. Ask any layperson what the word 'bank' brings to mind and he will probably tell of Godzilla sized organizations with slow moving process bureaucracy. Are they equipped to face the digital finance technology revolution? Revolting against emerging trends is easy for the banks. They certainly have the wherewithal to do so. Splurge lots in opening up new branches, provide more concierge services etc. But their revolution will be short lived. Why? Because the work process of traditional large banks is fundamentally broken. Simpler services like providing checking accounts, lending, financing, payments, wealth management are provided under one roof. But challenge arises when complex financial products like derivatives, credit default swaps comes into picture. Such products are so muddled that even top financial experts rack their brains to clearly understand the 'how-to's. Add to that enormous costs of maintaining physical infrastructure and you can see why the lumbering Godzilla metaphor is apt. Unfortunately, customers are the ultimate losers as the banks lose focus on customer service and are more preoccupied over maintaining margins. ATMs were introduced in the 1960s, online banking in the 1990s, its 2016 and we are yet to see a revolutionary game changer product from banks. History is not kind to their track record. It took banks almost 30 years to introduce online banking. Another important factor that will foil banking revolt is customer loyalty. For any revolution to succeed, participant loyalty should be high. Sadly, people are consistently losing trust in traditional banks. They view it as the 'Big Evil', using depositor money to overpay inept executives and binge of vanity headquarters and branch offices. The bigger the bank, the bigger disdain it has for customers (as shown in Arishima's case), no matter how much lip service they give for PR purposes. New digital fintech firms on the other hand, deliver excellent customer service with asset light operations. People and organisations are inherently opposed to change. But change forces us to grow, expand and diversify. The same can be said for banks. They can evolve by embracing digital finance technology like Digital CRM. Banks in emerging economies are already doing it. One of CRMNEXT's customers, HDFC, the largest private lender in Asia uses CRM solution algorithms to identify creditworthy customer and accordingly offers relevant products. Gone are the days of cumbersome data input and gathering. Simplicity is the key. In the battle with digital fin-techs, despite ominous pundit predictions, there is still plenty of room for banks to maneuver. Unlike banks, digital fintech (as of now) can only provide business loans. Asset management, consumer loans and other services are out of their scope (though firms like Klarna may soon change that). Banks can seize the initiative by putting people once again in the driver seat. They already have specialized experience and just need to make their services easy to use for delivering an excellent customer service. Implementing a cloud CRM solution is the way to go. In conclusion or is it? Despite their enormous war chests and lobbying power, banks have been slow to evolve. They better do (and fast). The Financial Services field is increasingly becoming crowded and Darwin's natural 'evolution of the fittest and leanest' might play out. Implementing a digital CRM is the way foward. It will be interesting to see how this battle between large, traditional banks and Digital Fintech firms will turn out. Pick your side!